UL Lafayette will host this year’s Intercollegiate Honor Band starting Jan. 18. 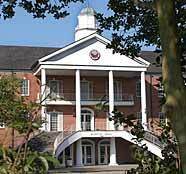 Sponsored by the Louisiana chapter of the College Band Directors National Association, the Honor Band will rehearse on UL Lafayette's campus starting Jan. 18 and will perform a concert in the Ducrest-Gilfry Auditorium in Angelle Hall on Jan. 20. Members are selected by band directors from 11 universities across Louisiana. Dr. Allan McMurray, Director of Bands at the University of Colorado - Boulder, will be the conductor for this year's band. Selections will include First Suite for Band by Holst, Children's Mark by Grainger, Dance of the Jesters by Tchaikovshy (arranged by Cramer), and Symphony Number 2 by Ticheli. The concert will start at 2 p.m. and admission is free.